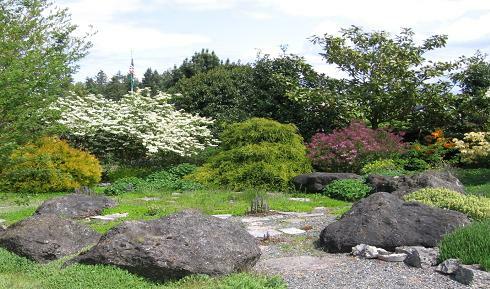 The Thurston County Demonstration Gardens serve as a model for the public of gardening techniques and recommendations of the Master Gardeners. It is a place where we test out different plants to come up with specific recommendations for our local area. Do you have a plant problem? Possibly a plant is eaten-up by bugs or diseases? Maybe you have a plant or weed you cannot identify? Or, you have a spot in your garden and you need advice on what to plant? That’s where the WSU Master Gardener volunteers of Thurston County can help. Come visit one of our Gardens or Clinics for the answers. The Gardens and Clinics are operated by WSU trained volunteers. These volunteers can only provide information to home gardeners. Commercial farms and businesses need to contact Extension office for help, 360-867-2162. The Garden, called Gallacci Gardens at the request of the Farmers Market board, originally consisted of plants donated by the vendors and the Market itself. Today this garden gem show examples of how to use small spaces for maximum efficiency in gardening and composting. Come wander the paths, learn something new, and enjoy this garden oasis in the city. The Olympia Farmers Market Garden is also home to one of our Plant and Insect Clinics. Feel free to stop by with questions for our trained Master Gardeners. Please note that we have limited resources at this clinic. You may be asked to bring plant problems that require more research to our Extension Office. No pets are allowed in the garden. Hours: The garden is open from dawn until dusk, year round. When available WSU Master Gardeners and/or Thurston County Master Recycler Composters serve in the garden on select days (typically Thursdays and Fridays) during normal Market hours. Directions: Olympia Farmers Market Garden is located at the East end of the market. The Market is located at the North end of Capitol Way in downtown Olympia. The Closed Loop Park Demonstration Garden is developed and maintained by Thurston County Solid Waste Division and WSU Thurston County Extension – Master Gardeners and Master Recycler Composters. This ornamental garden is an excellent example of how we can reuse a former landfill site. It uses only 18 inches of soil above an impermeable protective liner to nourish a wide variety of plants, shrubs, and trees. Come out and stroll through the two-acre garden and view over 150 varieties of sedum and peonies. In addition, Closed Loop Park also houses test beds for several “Great Plant Picks,” a large composting demonstration area, native gardens, a quiet picnic are among the beds, and a gazebo for relaxing. Also, located nearby is a play yard for children. The garden is located adjacent to the Thurston County Dog Park. Leashed dogs are welcome in the garden but please note that not all plants in the garden are dog friendly. The garden has been here for 25 years and some of the plants are part of a long-term trial so they can’t be removed. Please watch your dog at all times and pick up their waste. Hours: Closed Loop Park is open the same hours as the Waste and Recovery Center. Visit http://www.co.thurston.wa.us/solidwaste/garbage/garbage-hours.htm for hours. Directions: Closed Loop Park is located inside the Thurston County Waste and Recovery Center (WARC) off of Hogum Bay Road. Take Exit 111 off of I-5, and travel north and turn right into the WARC entrance. Look for signs. Dirt Works garden was developed through a partnership with the City of Olympia and is located inside Yauger Park in West Olympia. Dirt Works highlights variety fo garden examples as well as yard waste and worm composting operations. 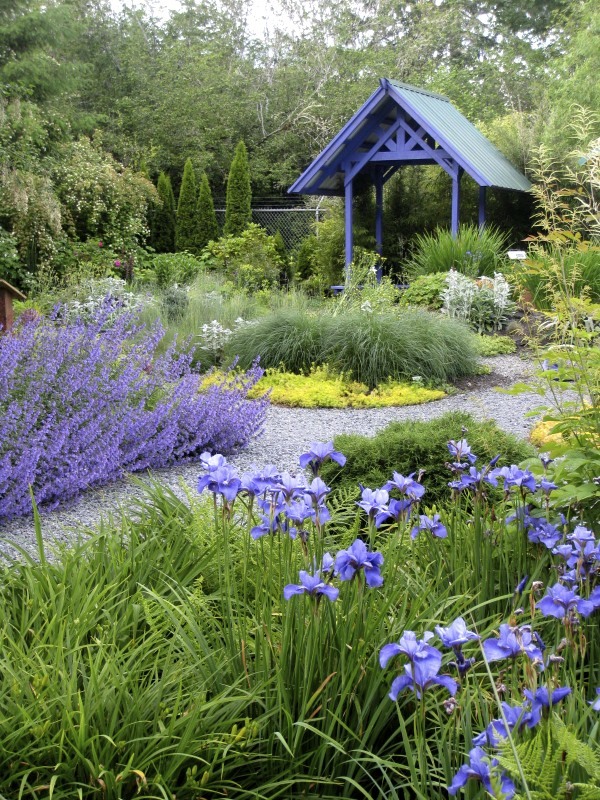 Garden examples include water-wise, native, mixed border, shade, rose, fruit, vegetable, rain and adaptive gardens. Dirt Works Garden hosts our summer Children’s Program for children ages 4 to 12. Visit our Workshop & Events page of this website to learn more. 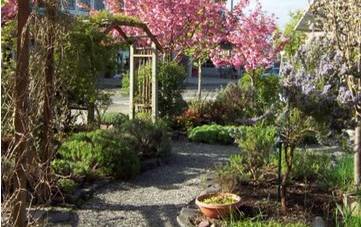 It is also home to the Master Gardener Foundation of Thurston County annual Plant Sale. The sale is held annually on the third Saturday in May. Great plants are available at great prices, and all proceeds from the sale go toward supporting the WSU Master Gardener and Thurston County Master Recycler Composter programs. Dirt Works Garden is open to the public during the times. We are also open select Saturday’s from 9am to 1pm. The garden will be open on Saturday…. We are also open on select Thursday evenings in the summer. The garden will be open from 5pm to 8pm on the following Thursday’s. Each evening has themed activities. Directions: Dirt Works is located on Olympia’s west side within Yauger Park. From the East, take Hwy 101 to the Black Lake Blvd. exit. Turn right off the ramp but stay in your left lane so you can turn left onto Cooper Point Road. Follow Cooper Point Road until you reach Capital Mall Drive SW. Turn Left. Follow Capital Mall Drive until you reach Alta street. Turn right and follow the road into Yauger Park. Dirt Works garden is at the end of the parking lot. From the West, take Hwy 101 to the Black Lake Blvd. Exit. Turn Left on Black Lake Blvd and go approximately 0.2 miles to Cooper Point Road. Turn Left. Go approximately half a mile to Capital Mall Drive SW. Turn Left. Travel approximately 100 yards from the corner and turn right onto Alta street. Follow the road into Yauger Park. Dirt Works garden is located at the end of the parking lot.